(CNN) — A shooting at a St. Louis business Thursday that left four people dead appears to be a murder-suicide, a police official said. The unidentified owner of A K Home Health Care is believed to be the gunman, police said. The others appeared to be employees. “Shortly thereafter, gunshots are shown penetrating a wall inside of the business,” police said in a statement. 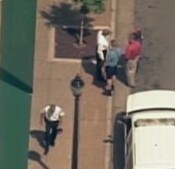 Police: Four fatally shot in St. Louis business – CNN.com.